King Arthur is dead. 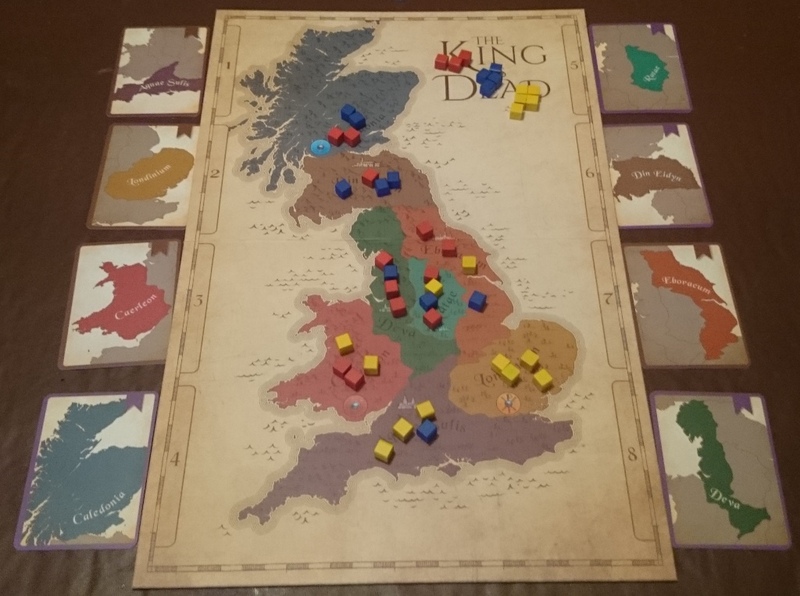 In the aftermath of his death, the Scots, Welsh and Romano-British fight for the newly vacant throne of England whilst in the background, the shadow of a Saxon invasion looms. 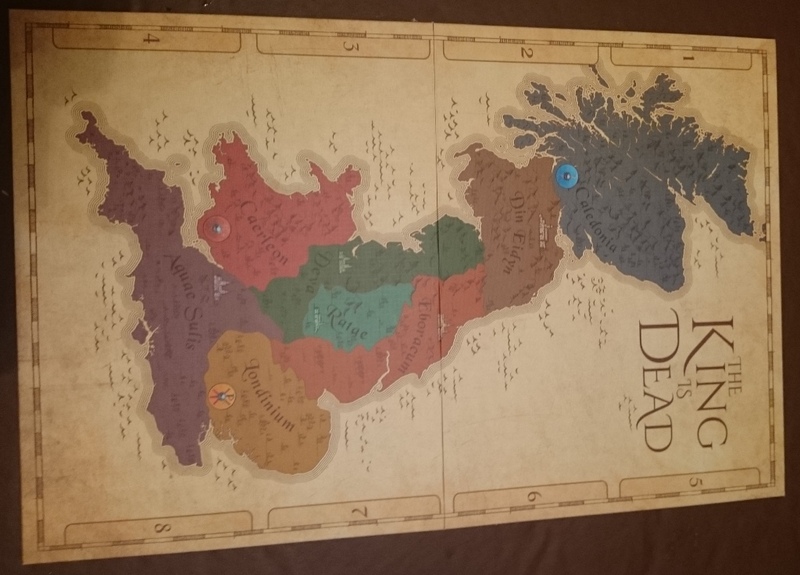 This is the introduction for The King is Dead – the first boardgame from Osprey Publishing, designed by Peer Sylvester. I had previously posted a blog post looking at the game components, but I’ve now played the game several times, so can give a full game review. This is a light area control game. It is essentially a reimaging of the game King of Siam, but with a different map and the addition of a fourth faction in the advanced game. The game can be played with two, three or four players (with four players, the players play as two teams). 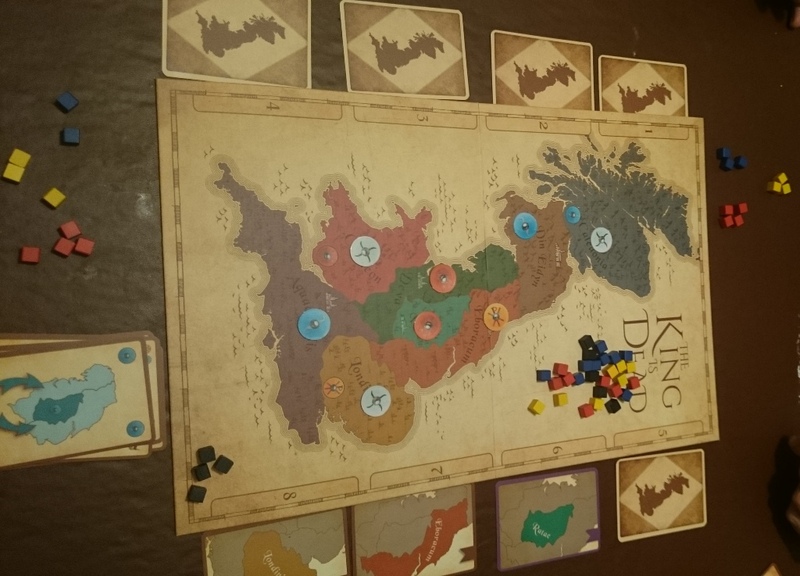 The idea of the game is that three factions – the Scots, Welsh and Romano-British are vying for control of Britain after Arthur has been killed at the battle of Camlan. The players are leaders, trying to gain influence with the different factions in order to crowned the new king. At the start of the game, each player draws two influence cubes from the bag – these cubes have to be a different combination for each player. The map is then ‘seeded’, with four influence cubes being placed in each area. Caledonia is guaranteed at least two blue cubes, Caerleon two red cubes, and Londinium two yellow cubes. 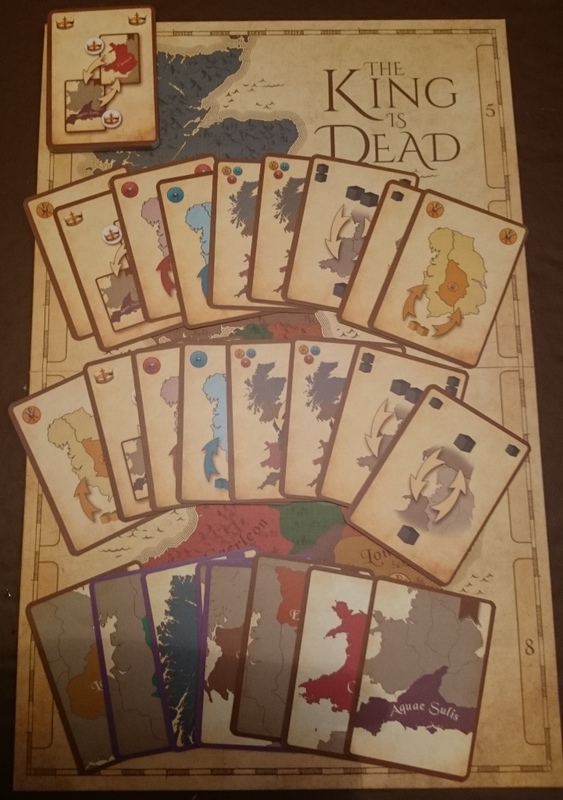 Each player has a hand of eight action cards. Each action card can only be played once during game. These actions allow the player to either move influence cubes around the board, or add new influence cubes to the board from the pool. Once a player has played all their cards, they are forced to ‘pass’ in each of their remaining turns. After playing a card, a player has to take an influence cube from the board and place it in front of him. The game has eight rounds. In each round, an area of the country is contended. Players take turns in playing action cards, and adding, moving or removing influence markers, until all players pass in consectutive turns. At that point, the round ends and control of the area is decided. All cubes are removed, and a control marker is placed in the area, depending upon which faction had the majority of influence. If he influence is tied, then no faction is awarded influence, and instead the area falls to the Saxons. All eight areas are contended, and control tokens placed. The winner of the game is player who has the most influence cubes in front of him of the faction who controls the most areas of the board. 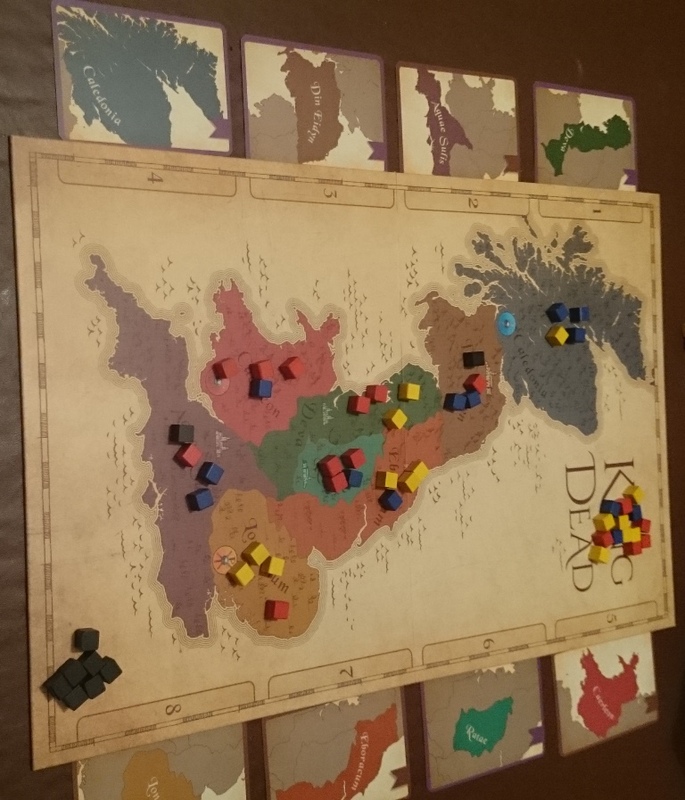 If the Saxons control four areas, the game immediately ends as the Saxons invade – the winner of the game is the player who has the most complete sets of influence markers (a set is three cubes, one of each colour) as he is able to unite the warring factions against the common enemy. An ‘advanced’ variant of the game introduces the followers of Mordred to the game, represented by black cubes. These cubes are placed Din Eidyn and Aquae Sulis during the game, but can still be moved around the board by players (though never removed). Should Mordreds followers ever win control of an area, the game ends immediately and victory is decided as above. 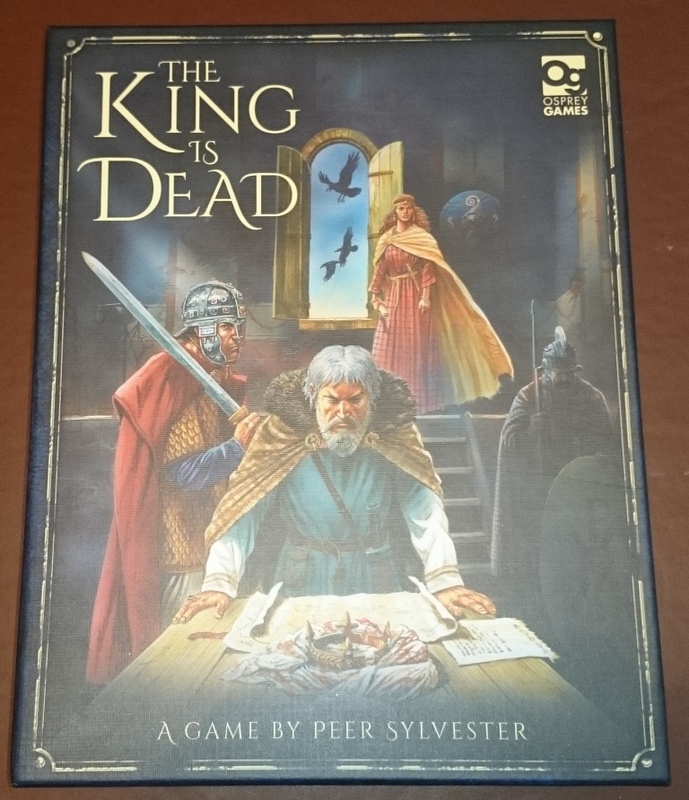 The King is Dead is a light, fast area control game – with two players in plays in about 30 minutes, probably between 45 – 60 minutes with a third or fourth player, but it certainly falls within the category of a filler game. The game components are good quality, with nice artwork and cardstock. The rules are well laid out, and easy to understand. The game is actually a fairly abstract area control game, so the theme – although well implemented – feels a little ‘pasted on’. Gameplay is straight forward, and offers strategic challenge without the fear of players becoming too bogged down in analysis paralysis. 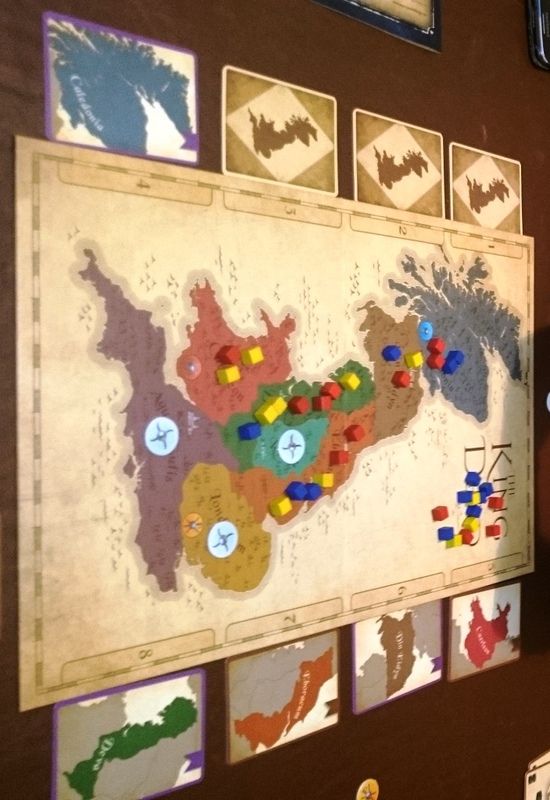 Whilst it plays OK with two players, it probably hits its sweet spot with three people playing, as the addition of a third player adds massively to the changes of influence being made during the game. If you like area control games, this is fast and fun, looks great but doesn’t outstay it’s welcome.